A field visit with Creative Matters to participate in the firm's Art Day creative process. Creative Matters is a Toronto, Ontario, Canada based firm specializing in floor and wall coverings catering to hospitality and contract clients the world over. The firm is also widely known in the handmade rug industry for its signature Nepali-Tibetan carpet collections available through various retailers often as private label or under exclusive distribution agreements. Without regard to how the carpets are sold however, it remains that the abundant creative energy of the firm is evident in each of their carpets. To avoid atë the firm implemented what has grown to become an ‘integral influence on the constant flow of creative design that emerges from the studio’ to quote Creative Matters. ‘Art Days’ allow the entire staff as a team, not just the designers, to immerse themselves in a technique or a subject matter in order to garner fresh and, as I came to discover, unexpected insight. By exploring various artistic techniques of photography, glassblowing, collage, and the like without a predestined use nor aesthetic, the firm is able to create a body of original artwork ‘from somewhere else’ some of which may be suited to an individual collection, others archived for potential use in future projects. The exploration of techniques foreign to some, familiar to others, fosters camaraderie and team building, while simultaneously fuelling the creativity of the firm. Last year, on Monday, 9 November 2016 I had the pleasure of visiting with Creative Matters for one such ‘Art Day’. The theme of the day was natural dyeing and it was organized by Junior Designer Kat Pezzano who shares my passion for colour and geometrics. A graduate of the Craft and Design (Textiles) program at Sheridan College she enjoys exploring the natural colours of Canada and playing with interesting colours from other natural sources around the world. This is a brief look behind the creative curtain. Some of the staff of Creative Matters reviewing the flowers, berries, sticks, and other natural items before the start of the Natural Dyes Art Day, 7 November 2016. | Image by The Ruggist. As a technical preface it should be noted that while the techniques used are consistent with and adapted from those used to dye textiles, including woollen yarn such as that used in handmade rugs, effort was not made to ensure the resultant dyed fabrics were fast. Moreover, as some of the flowers used in the process were undoubtably themselves dyed, no claim is made that the process was entirely natural. Cotton, wool, and silk fabrics with various mordants were utilized and as a result some processes were more akin to staining than dyeing. These are technical concerns not relevant to the stated goal of exploration and raw creation. Creative Matters’ offices are located in a former bank building – complete with vaults – with the primary office space occupying the main floor. The basement houses flexible studio space and the kitchen which served as the impromptu dye shop for this ‘Art Day’, while the rooftop deck – a lovely spot to enjoy a quiet lunch in the city – served as the makeshift drying facility (read: clotheslines on the roof, how urbane!). This latter element is highly reminiscent of prayer flags and provided a bit of foreshadowing for the later legs of my journey as this was a sojourn en route to Kathmandu, Nepal, but I digress. Fabric and twine encase bundles of sticks, flowers, plants, berries, and more await their turn in the steam bath to set the dyes during the Natural Dyes Art Day at Creative Matters on 7 November, 2017. | Image courtesy of Creative Matters. Tasked with planning the day Pezzano prepared the various fabrics to be used as well as tasked the other staff with the collection of flowers, sticks, berries, and other fauna to be used in the first portion of the day which involved creating wrapped bundles of fabric and plant. To me this was the most organic portion of the exercise, no humour intended. Flowers and parts thereof, berries, and leaves – some in a state of decay given it was early November, sprinkled on fabric then rolled tightly around a stick, itself providing some tannins adding to the imperfect process; wrapped with twine, the varying tightness may or not have provided some degree of resist to the dying. Once a sufficient quantity of bundles had been created the entire lot of identified sticks (more on this later) were steamed to transfer and set the dyes. 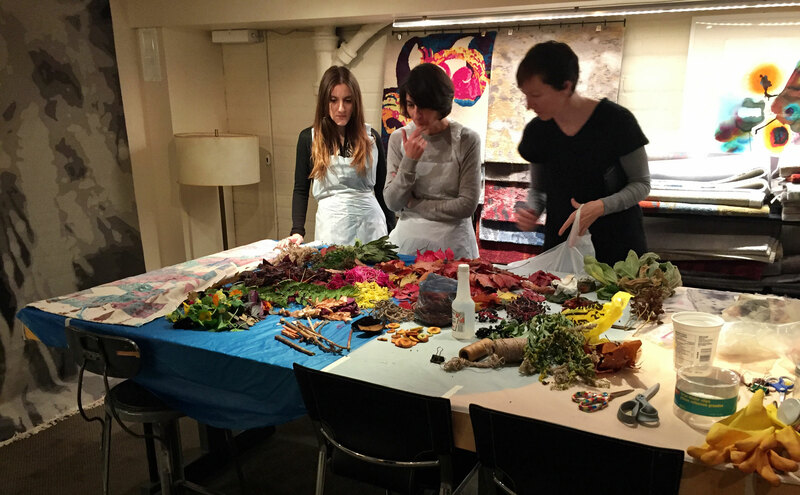 Anxious anticipation as Kat Pezzano (right) explains the process for the Natural Dyes Art Day at Creative Matters on 7 November, 2016. | Image by The Ruggist. The second half of the day involved an exploration of various manners of resist dying. For those familiar with Shibori or the more Americanized tie-dying, this was more or less the process. 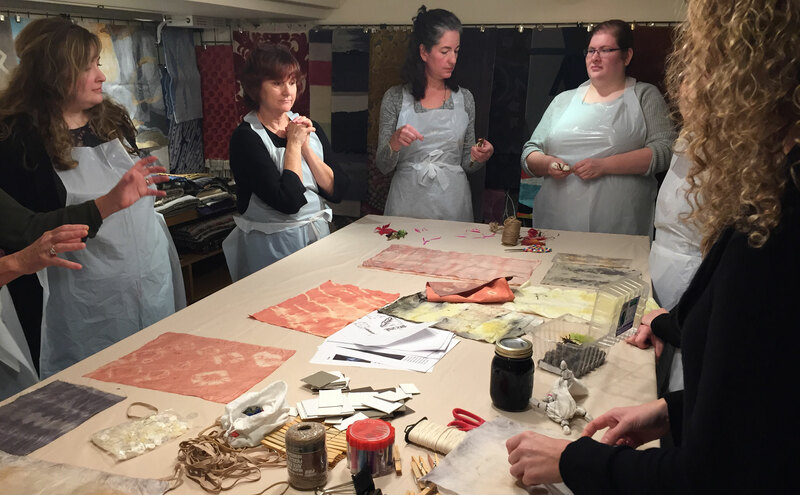 As before participants were able to choose a fabric and then fold it over cardboard squares, tie it around marbles, and utilize wax coated twine to both expose and shield sections of the fabric from the dye. Pezzano had prepared a few dye baths and mordant solutions into which the fabric parcels could be dipped including turmeric and lac. For those unfamiliar as was I, lac produces the most spectacular of richly nuanced scarlet hues. On silk, it dazzles in the sunlight. And just as this story concludes unexpectedly soon, it was lunchtime and the ‘Art Day’ was over. We all hung our wet fabrics out in the sun to dry, and the pressing client work of the day continued. But what happened next? 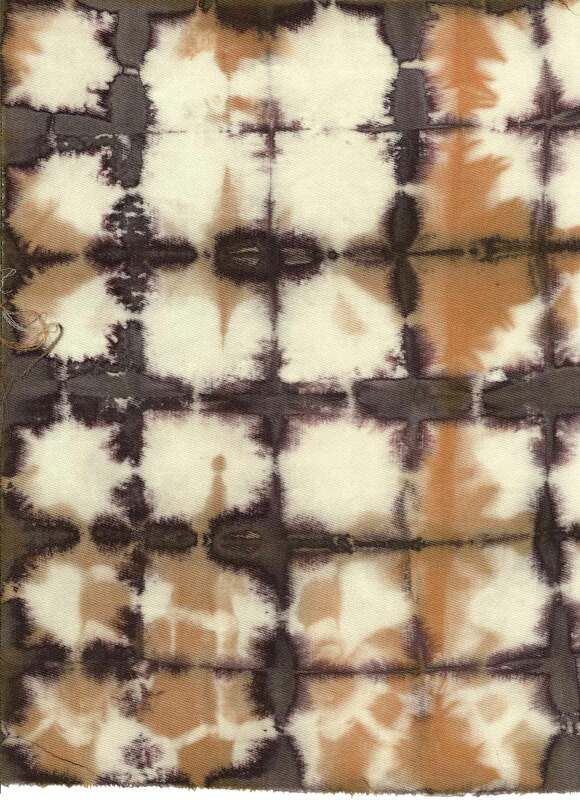 Scan of a piece of dyed/stained cotton made by Michael Christie (The Ruggist) during the Natural Dyes Art Day at Creative Matters. This piece went on to inspire the carpet ‘Ichiban’ which debuts at The Rug Show at Javits, 10-13 September, 2017. | Scan courtesy of Creative Matters. Later as the sun dried our various fabrics they were brought back into our basement studio for review. Which side looked best? What colours popped? What colour combinations delighted? Which fabrics looked like rugs? Which ones had little elements to be incorporated into a larger design? This is where the magic – if such a thing exists – of ‘Art Day’ happens; in the reflective analysis of what has been made. Some elements immediately jump to attention, whereas other may lie dormant waiting to be discovered only later when the need serendipitously arrises. To facilitate this archive of original work all of the fabrics (or other artwork depending on the theme of the particular day) are scanned or photographed with the catalog available to any Creative Matters designer. Furthermore, no matter the forced structure one might try to impart in the preparation of a stick bundle or a resist parcel (and believe me I tried), the results – while predictable to a degree – maintain an elusive and hidden spirit that is the essence of the success of ‘Art Day’. But as is said, you don’t have to take my word for it. 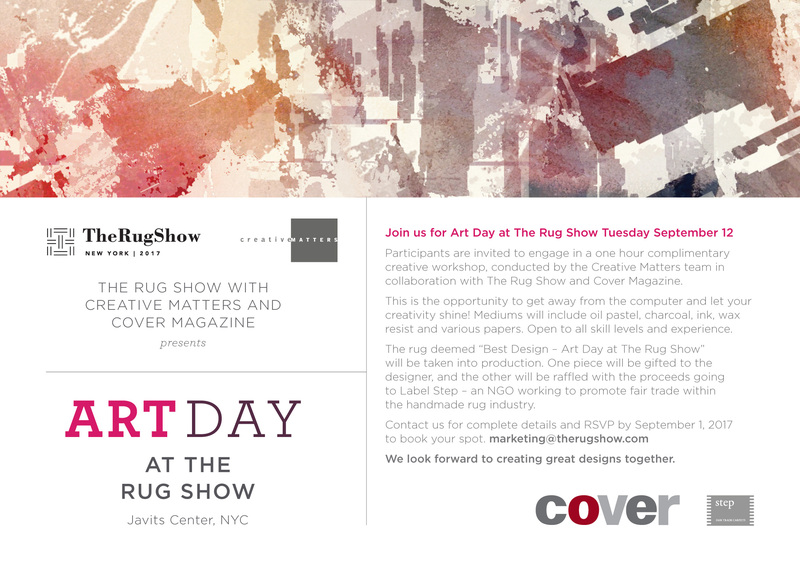 Creative Matters is hosting a special edition of their ‘Art Day’ during The Rug Show in conjunction with COVER Magazine and Label STEP. | Image courtesy of Creative Matters. Creative Matters in conjunction with COVER Magazine and Label STEP are presenting ‘Art Day at The Rug Show’ at the forthcoming The Rug Show 10-13 September 2017. The ‘Art Day’ will take place on both Monday, 11 and Tuesday, 12 September and allow registered guests the chance not only to participate, but also to have their design translated into a rug. The work deemed ‘Best Design – Art Day at The Rug Show’ will enter production with one carpet gifted to the designer and another raffled with the proceeds benefiting Label STEP. While only one design will be selected as the ‘best’ it is also best not to think of this as a competition nor contest. The goal of ‘Art Day’ is not to win but to broaden understanding of the nature of creativity and design, to see beyond the known, embracing what might come to be, to educate oneself. As such the program is accredited by IDCEC with participants eligible for one (1) CEU should your professional designation so require. Further details and registration information can be found in the above invitation or by contacting the marketing department of The Rug Show. If you would like to participate with yours truly, The Ruggist, I’ll be in the 14:00 (2:00PM) Tuesday session just prior to the afternoon cocktail reception which is totally not a coincidence. 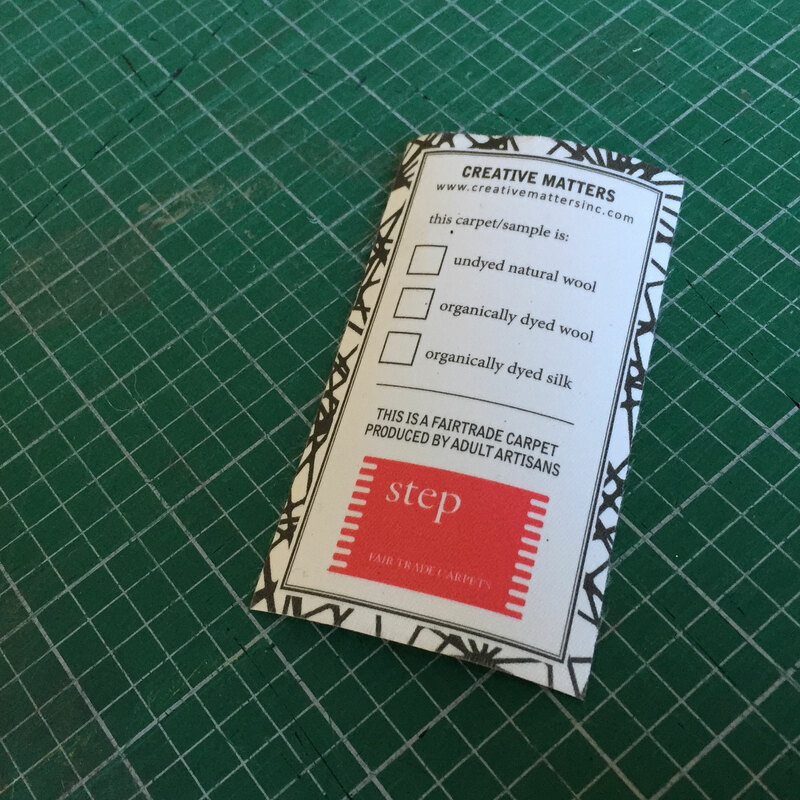 Creative Matters is a proud supporter and partner of Label STEP. The firm’s President Carol Sebert is a Label STEP Ambassador working to promote the organization and the work they do. | Image by The Ruggist. Earlier I mentioned the bundles of sticks were labelled with our names for identification purposes; this also holds true for the resist dyed parcels. The reasoning is multi-faceted but comes back to a core tenet of Creative Matters. While copyright of the work done by any of the staff is rightly the property of Creative Matters by way of employment contract, the firm does not shy away from but rather enjoys highlighting the work of its individual deisgners, adding their personalities to the story behind each design. For those that go on to become carpets as part of the firm’s signature Nepali-Tibetan collection, this story is an added bonus retailers, and in turn end consumers, can talk about: ‘This design was inspired by…’ and the like. Moreover, as Creative Matters is a partner with Label STEP, everyone involved in the creation of a carpet is treated equitably and fairly. Case in point! The fabric shown above which went on to inspire the forthcoming Creative Matters’ carpet ‘Ichiban’ was dyed by me, a fact that while not overlooked, was how do you say, not readily apparent when the carpet design was refined for production. This owes to the fact that Creative Matters had not previously entertained guests for an ‘Art Day’. Upon discovery, the firm reached out to resolve ownership of the copyright – the terms of which are amicable to both parties – with Creative Matters now as the sole owner thereof. The design, part of their Shibori Collection as previewed in their ‘inspiration 2’ look book, is named ‘Ichiban’ – Japanese for ‘number one’ or ‘first’ – in honour and recognition of it having been created on my first trip to Nepal.